Some of the loneliest people are seniors, experts said. As people reach their 80s and 90s, friends be gin to die, and their social circles shrink. But that could possibly change with the aid of modern technology. Researchers at the University of Alabama at Birmingham's Sociology Department are studying the effect of social networking -- the Internet kind -- on residents at as sisted-living facilities throughout the state, with the college students teaching seniors not only how to use networking skills, but in some cases how to turn on the computer...the research aims to discover whether using Internet social networks will decrease lone­liness and ultimately help lower the rate of depression among seniors. Very interesting. I wonder if the boomers will be healthier, live longer, hang together and not be as lonely? With all the emphasis that programs have on gerontology, we will be around to help support this population for years to come. I find this article very interesting, regarding lonliness and internet/computer use with the elderly. Everyone needs some form of interaction. Some of my family members who are elderly, appear to enjoy working on the computer, especially since they can change the text on the internet to appear in big fonts, which helps them to see the computer images on the screen better and not feel slighted because of their vision problems. 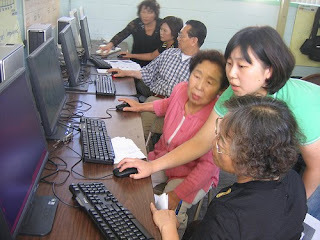 I believe that teaching the elderly population about computers may prove beneficial, especially since this is a very technological age. All Over but for the Shouting!